The lie, presentation and position of a fetus are important during labour and delivery. In this article, we will look at the risk factors, examination and management of abnormal fetal lie, malpresentation and malposition. Lie – the relationship between the long axis of the fetus and the mother. Presentation – the fetal part that first enters the maternal pelvis. Position – the position of the fetal head as it exits the birth canal. Other positions include occipito-posterior and occipito-transverse. 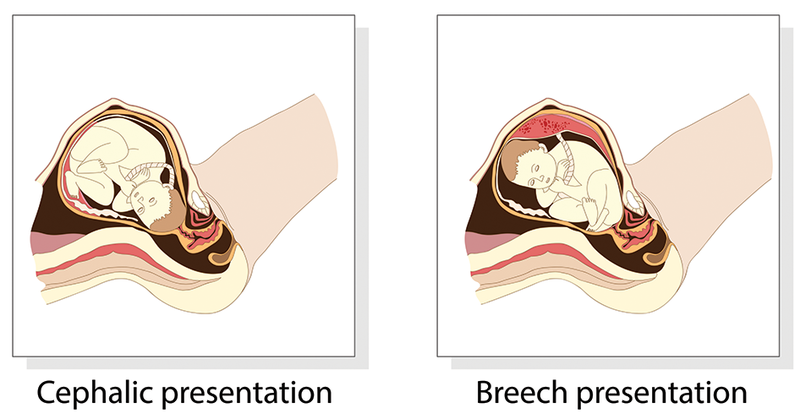 Note: Breech presentation is the most common malpresentation, and is covered in detail here. 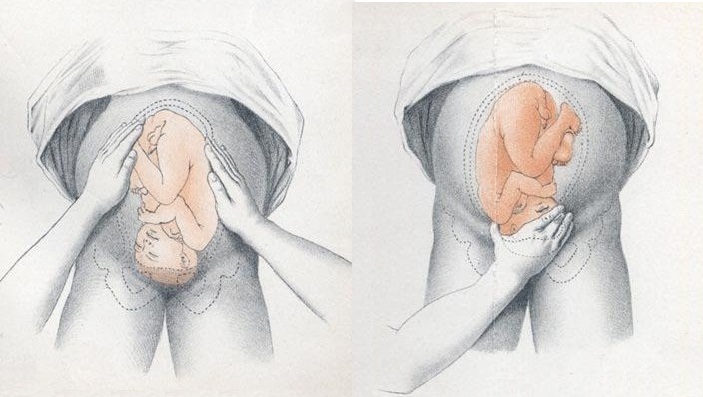 Fig 1 – The two most common fetal presentations: cephalic and breech. The fetal lie and presentation can usually be identified via abdominal examination. The fetal position is ascertained by vaginal examination. For more information on the obstetric examination, see here. The fetal lie and presentation may not be possible to identify if the mother has a high BMI, if she has not emptied her bladder, if the fetus is small or if there is polyhydramnios. During labour, vaginal examination is used to assess the position of the fetal head (in a cephalic vertex presentation). The landmarks of the fetal head, including the anterior and posterior fontanelles, indicate the position. Any suspected abnormal fetal lie or malpresentation should be confirmed by an ultrasound scan. This could also demonstrate predisposing uterine or fetal abnormalities. If the fetal lie is abnormal, an external cephalic version (ECV) can be attempted – ideally between 36 and 38 weeks gestation. ECV is the manipulation of the fetus to a cephalic presentation through the maternal abdomen. It has an approximate success rate of 50% in primiparous women and 60% in multiparous women. Only 8% of breech presentations will spontaneously revert to cephalic in primiparous women over 36 weeks gestation. Complications of ECV are rare but include fetal distress, premature rupture of membranes, antepartum haemorrhage (APH) and placental abruption. The risk of an emergency caesarean section (C-section) within 24 hours is around 1 in 200. ECV is contraindicated in women with a recent APH, ruptured membranes, uterine abnormalities or a previous C-section. Fig 3 – External cephalic version. The management of malpresentation is dependent on the presentation. 90% of malpositions spontaneously rotate to occipito-anterior as labour progresses. If the fetal head does not rotate, rotation and operative vaginal delivery can be attempted. Alternatively a C-section can be performed. Which of the following correctly describes the presentation of the fetus? What is the most common position of the fetal head? Which of the following fetal characteristics is usually determined via vaginal examination? A 35/40 primip is seen in the obstetric clinic. Clinical examination suggests a shoulder presentation. Which investigation is most appropriate? Which of the following presentations is a absolute indication for Caesarean section?